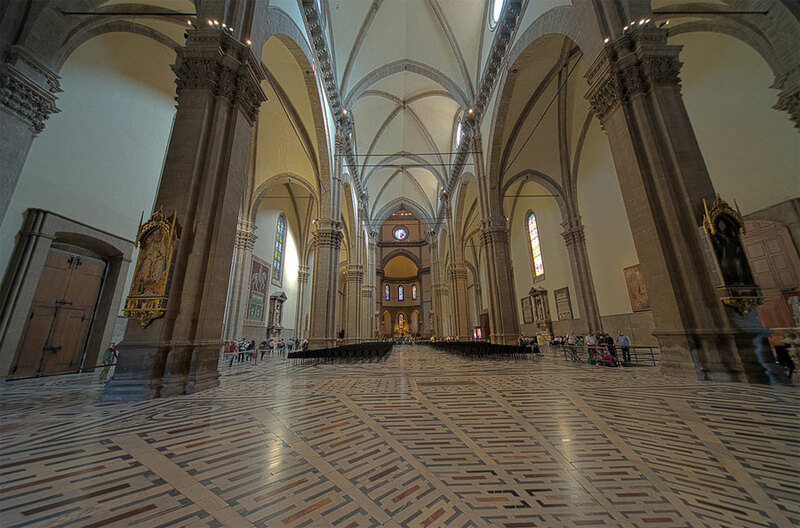 as well as being the fourth largest church in the world. 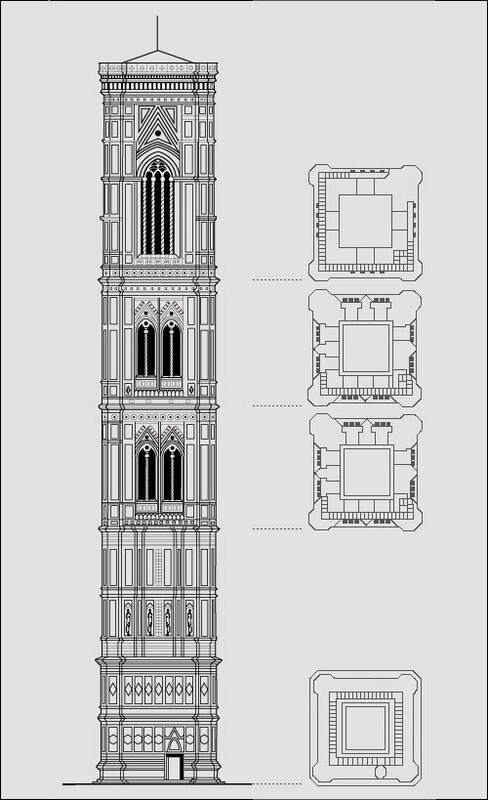 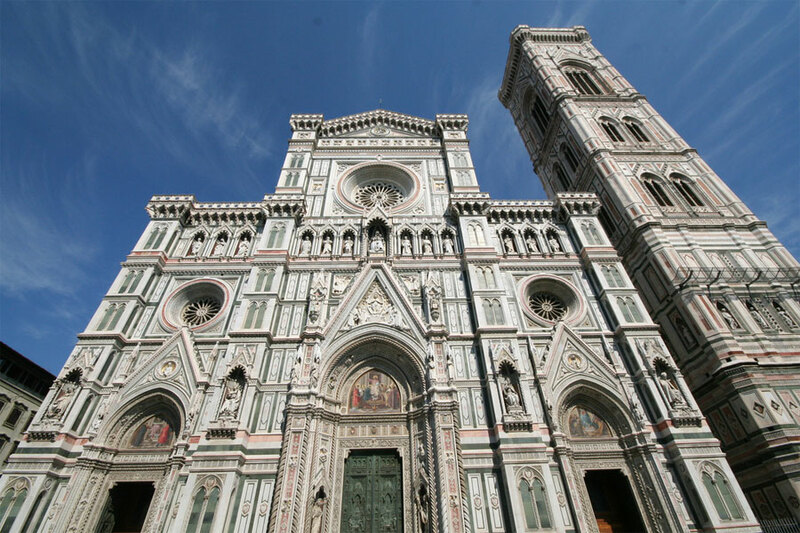 The typical Italian Gothic building, the Cathedral of Florence, is dedicated to "Santa Maria del Fiore". 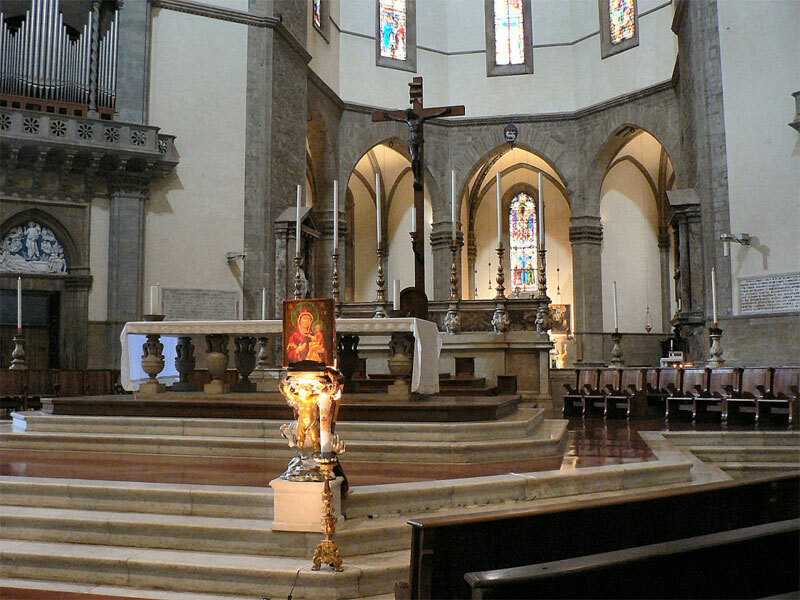 The church was designed by Arnolfo di Cambio (c1245-1302) who considerably enlarged the existing religious structure. 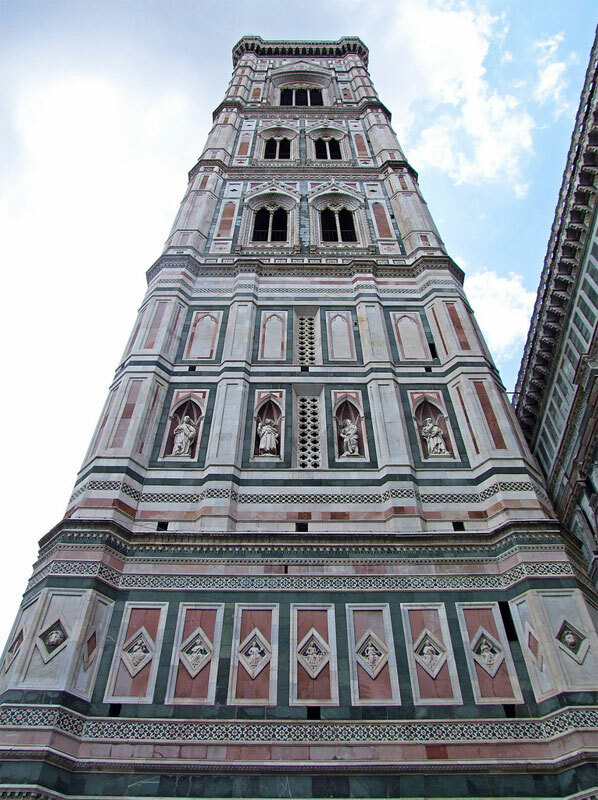 Finished around 1367, the Cathedral was completely covered by coloured marbles like the earlier Baptistery, except for the façade that remained unfinished and was terminated only in the 19th century. 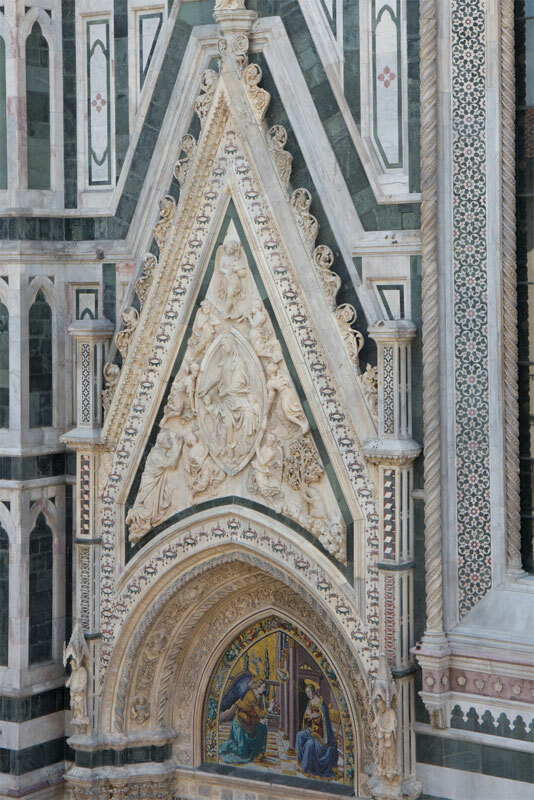 One of the most remarkable features of the outside of the building is the socalled "Porta della Mandorla"(north) (della mandorla = almond) that was given this name because of the large aureole around the figure of the Virgin sculptured also by Nanni di Banco (1380/90-1421) among others. 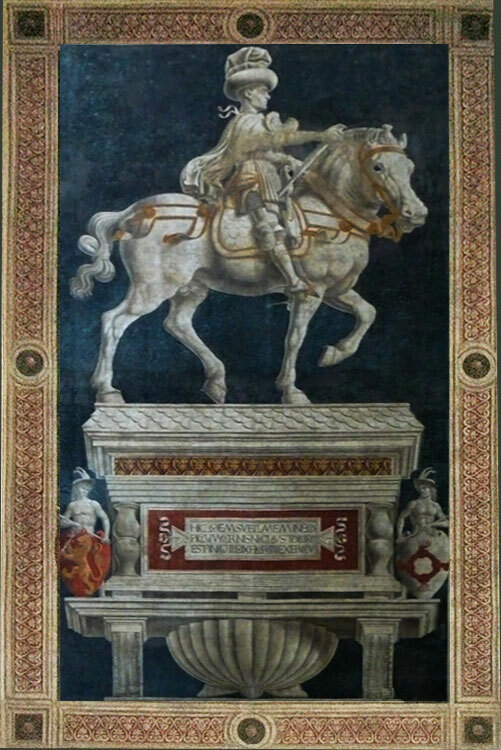 Its interior preserves very important works of art: on the left side we find the first two detached frescoes showing the "Condottiero Giovanni Acuto"and "Niccolò da Tolentino" painted respectively by Paolo Uccello in 1436 and by Andrea del Castagno in 1456. 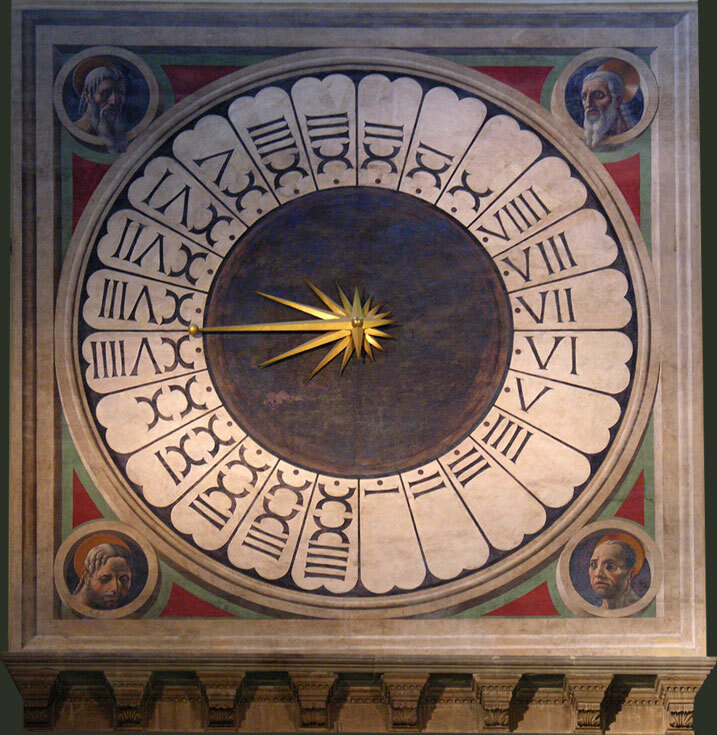 Paolo Uccello also frescoed the clock on the inside wall, showing four vogorous "heads of saints". 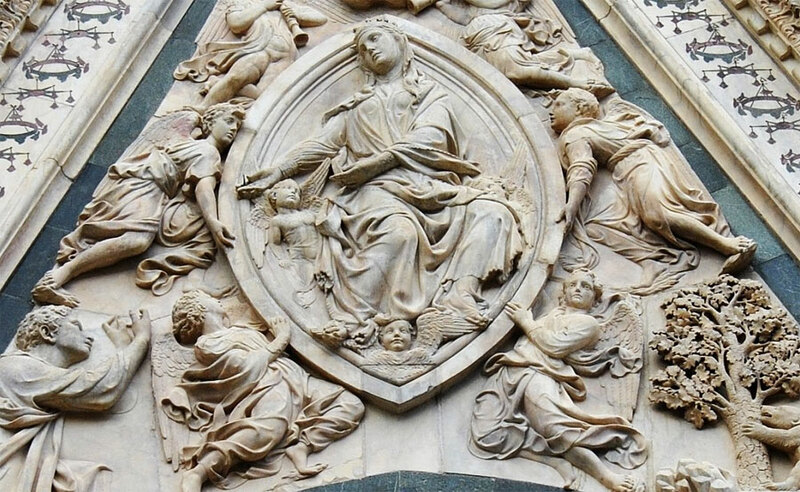 The many sculptures made specifically for the cathedral (many of which have now been moved to the "Museo dell´Opera del Duomo"), comprise also the "Lunettes" by Luca della Robbia above the doors of the Mass Sacristies. 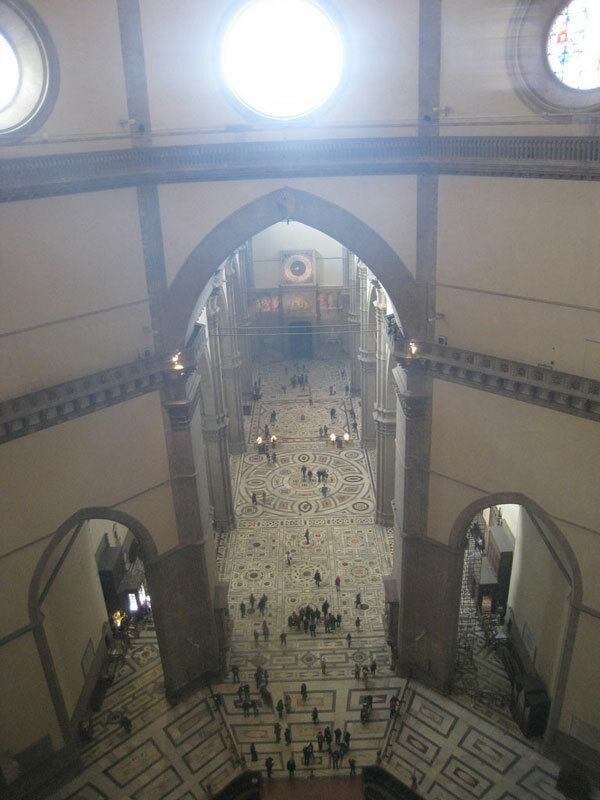 The large "Pietà" by Michelangelo (c. 1553) has instead been removed and transferred to the "Museo dell´Opera del Duomo". 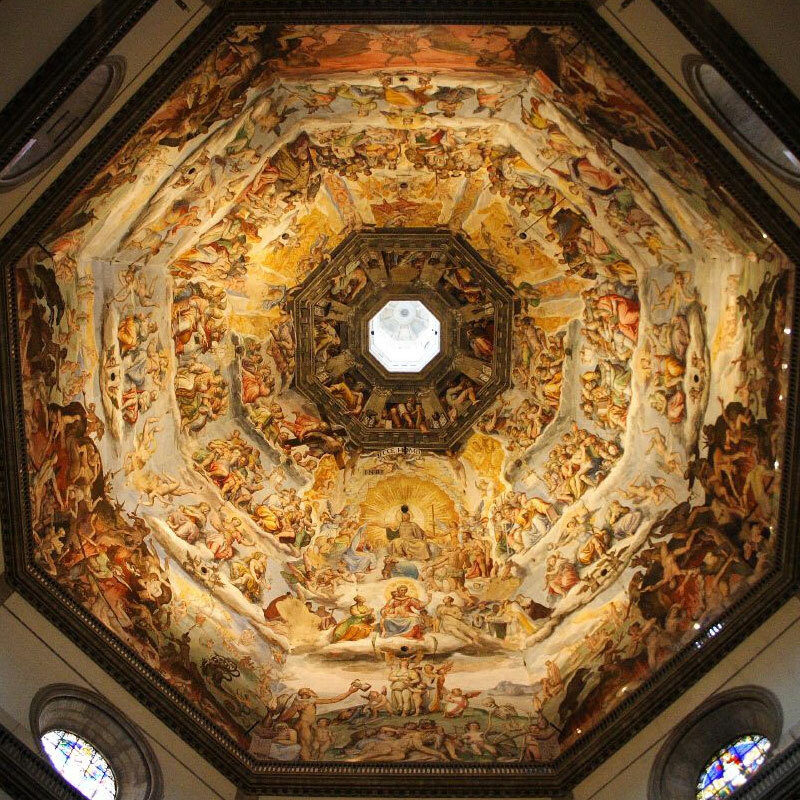 The internal walls of the dome, which have recently been restored, were frescoed between 1572 and 1579 by Giorgio Vasari (1511-1574) and Federico Zuccari (c. 1990-1609) who represented a large scene of the "Final Judgement". 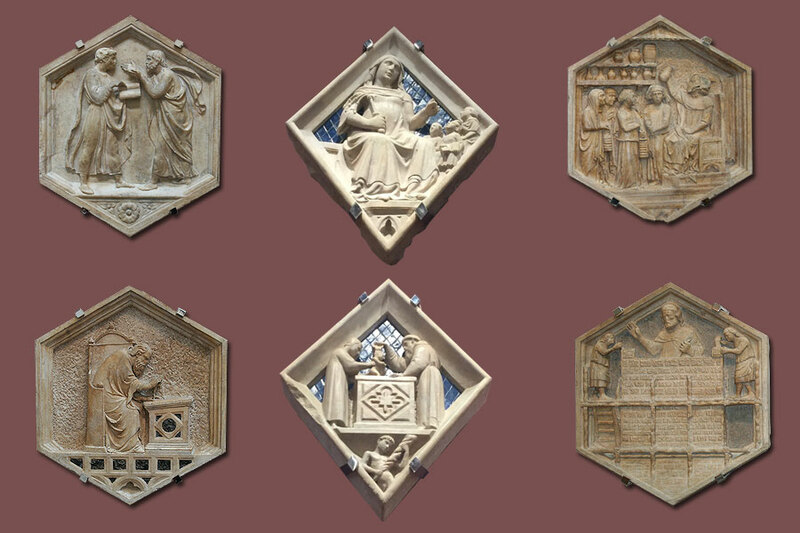 The reliefs in the lower row of the campanile, depict the creation of man and woman, the beginnings of human work, and the "inventors (according to the Bible) of various creative activities: sheep-herding, music, metallurgy, wine-making. 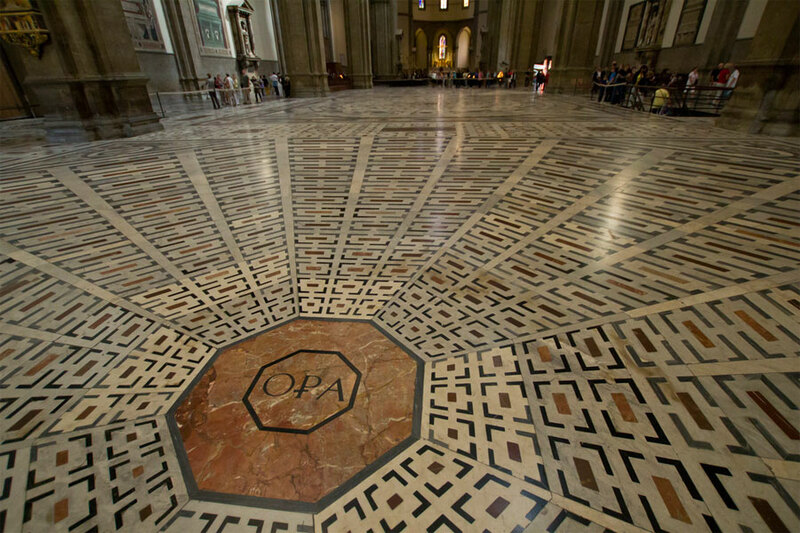 In the upper register are the seven planets, beginning with Jupiter at the north corner. 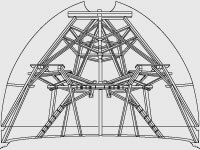 On the other facades, in the lower registerwe find astrology, building, medicine, weaving and other technical and scientific endeavors. 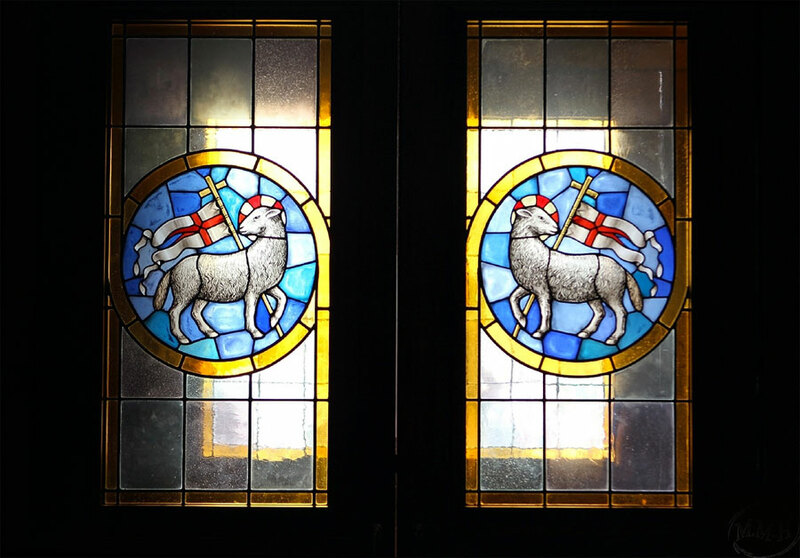 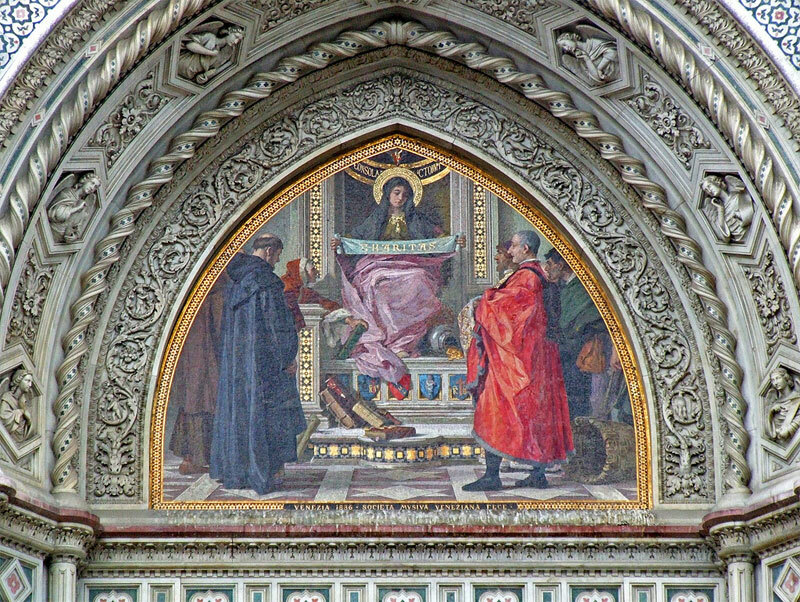 In the upper registers are: on the south, the theological and cardinal virtues; on the east, the liberal arts of the Trivium and Quadrivium; to the north, the seven sacraments. 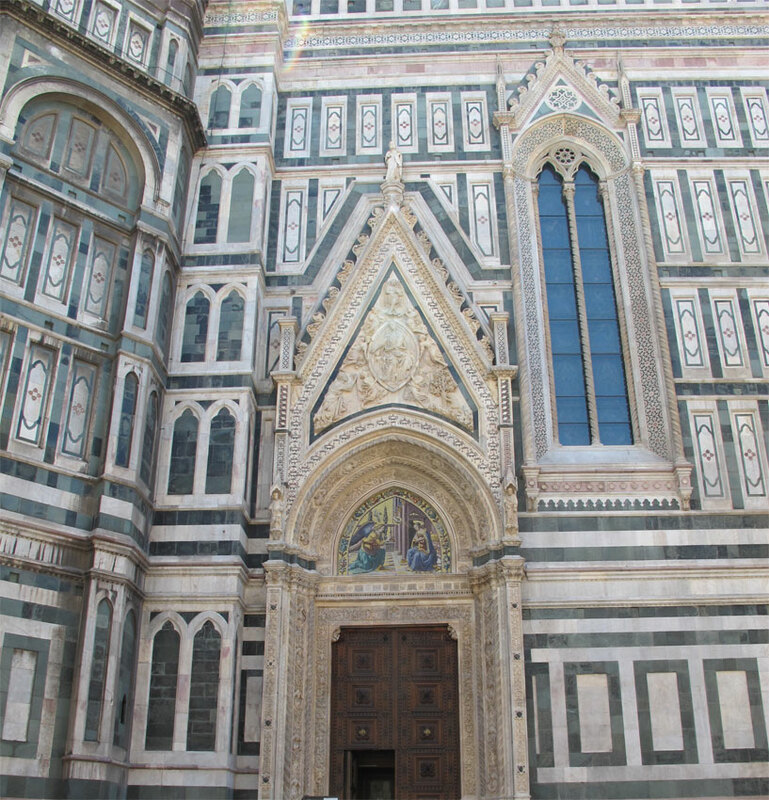 The statues in the niches represent the patriarchs, prophets and kings of Israel, and pagan sybils. 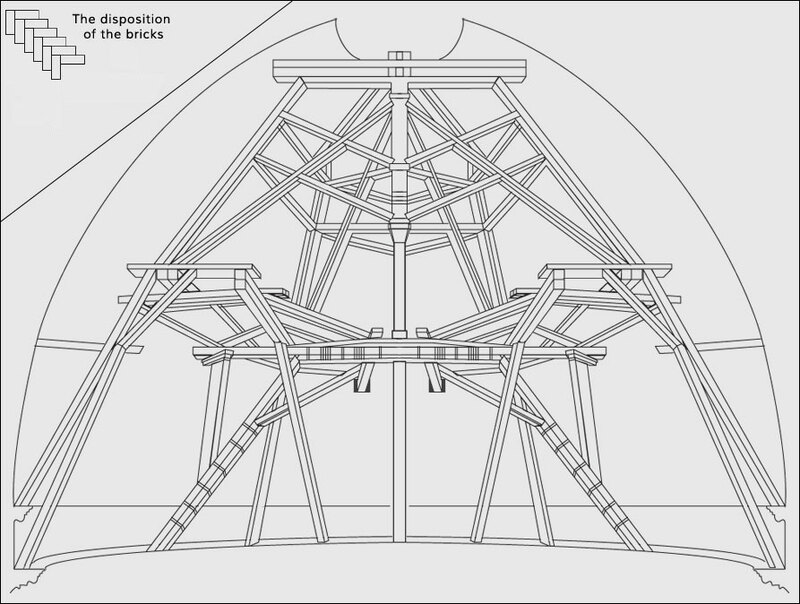 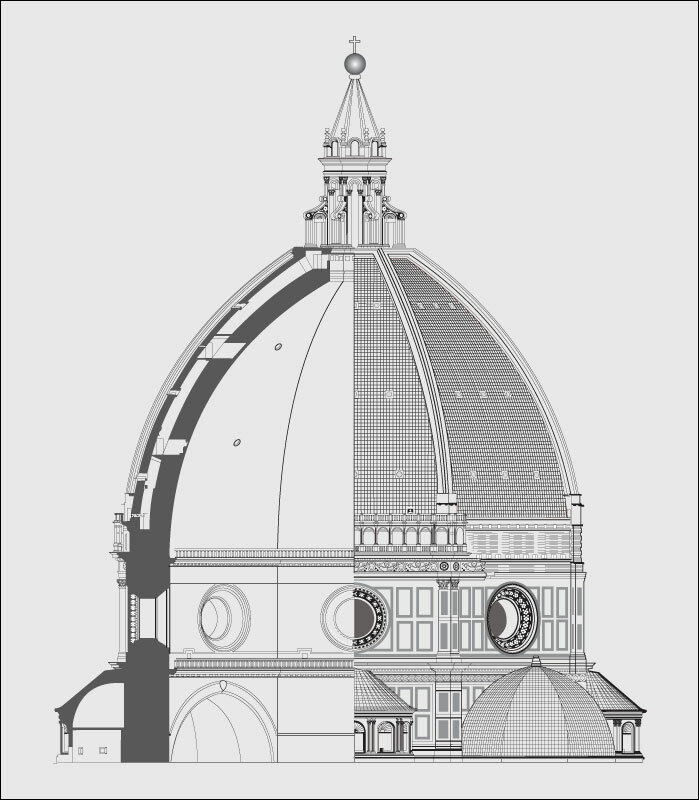 in the construction of the dome. 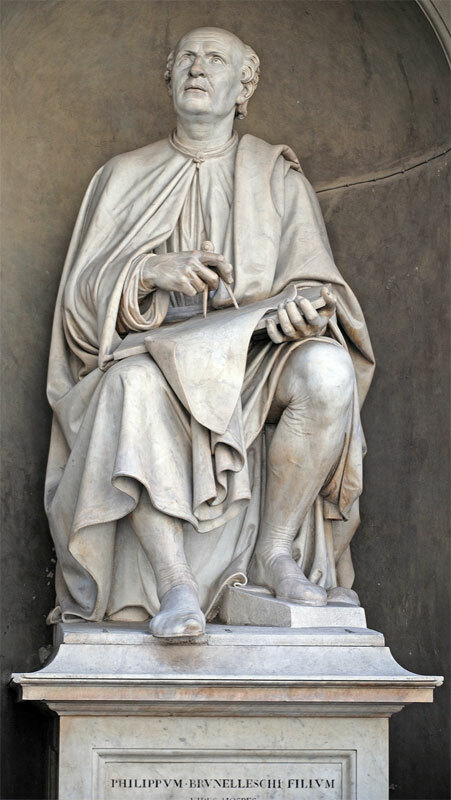 Dante's 200th birthday. 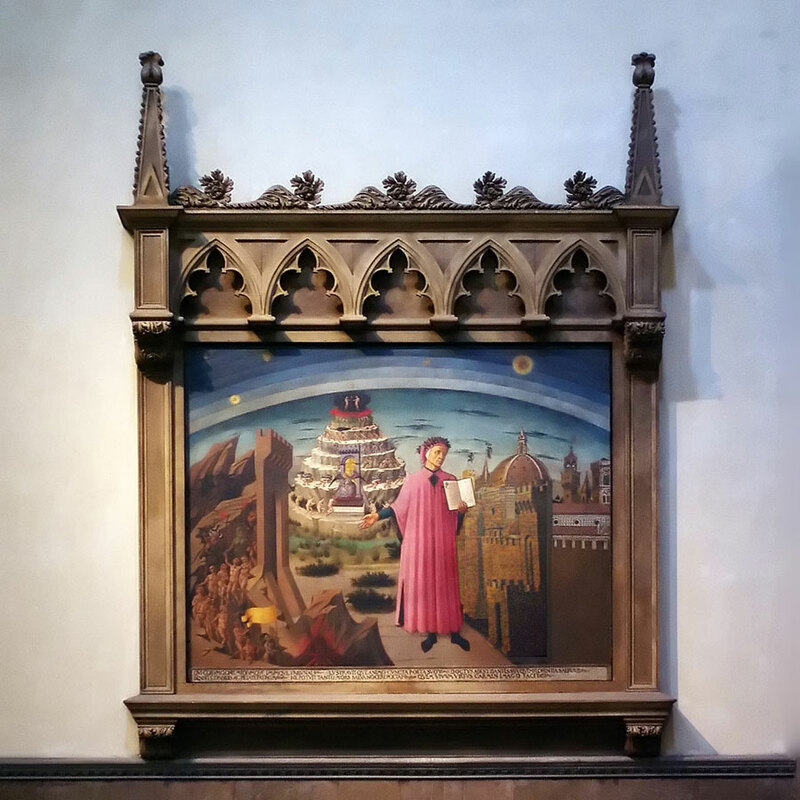 It dipicts scenes of Dantes Divine Comedy: the hell, the mountain of purgatory and the earthly paradise with Adam and Eve. 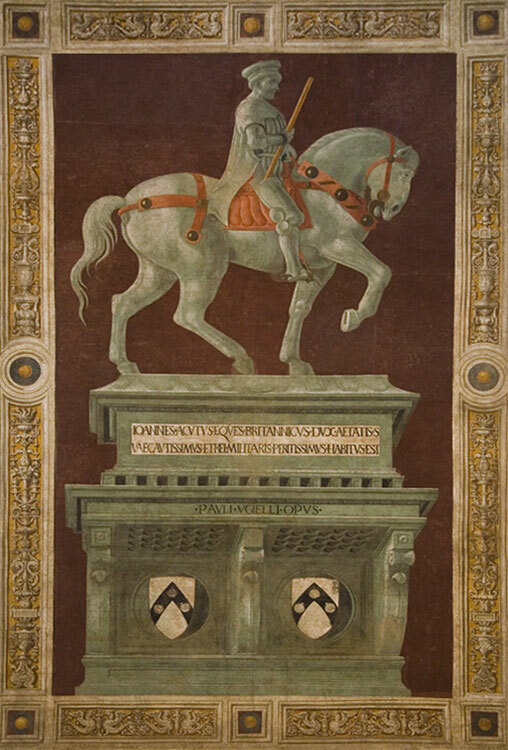 fresco portraits of four Prophets or Evangelists by Paolo Uccello (1443). 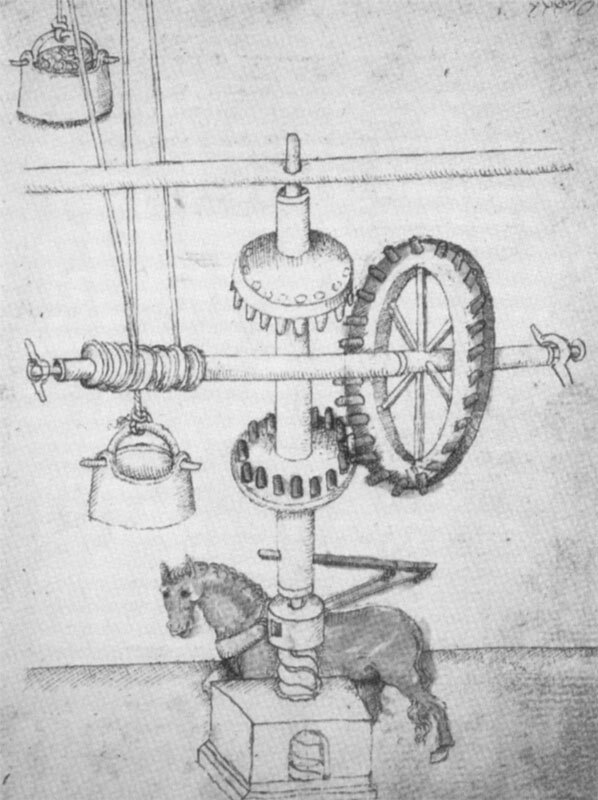 that still exist and are in working order. 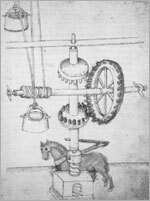 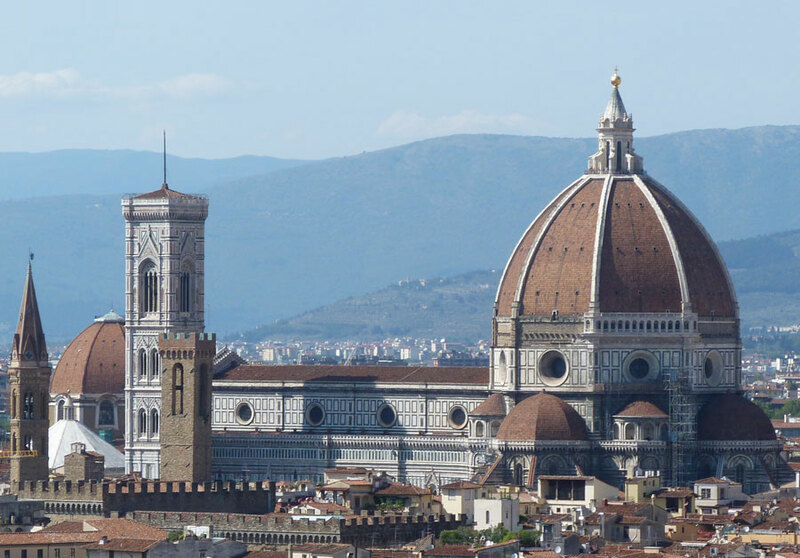 who worked there from 1572 to 1579.
in 1978 and was completed in 1994.
of Florence during the late Middle Ages and in the Renaissance. 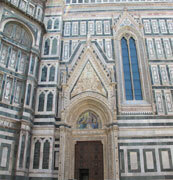 of the most important edifice in the city, namely the Cathedral. 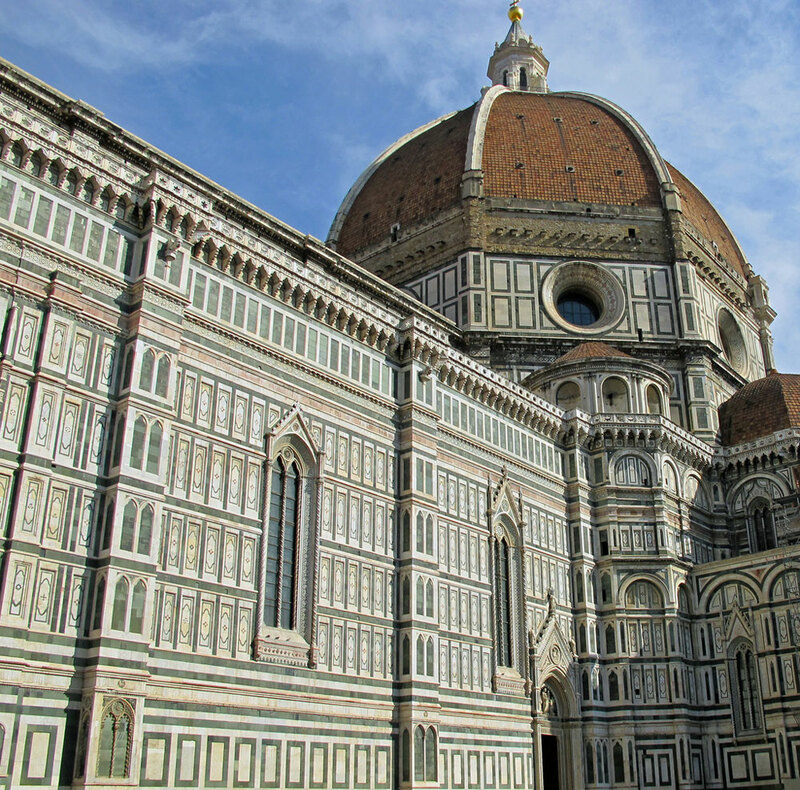 Brunelleschi is still looking up at his work. 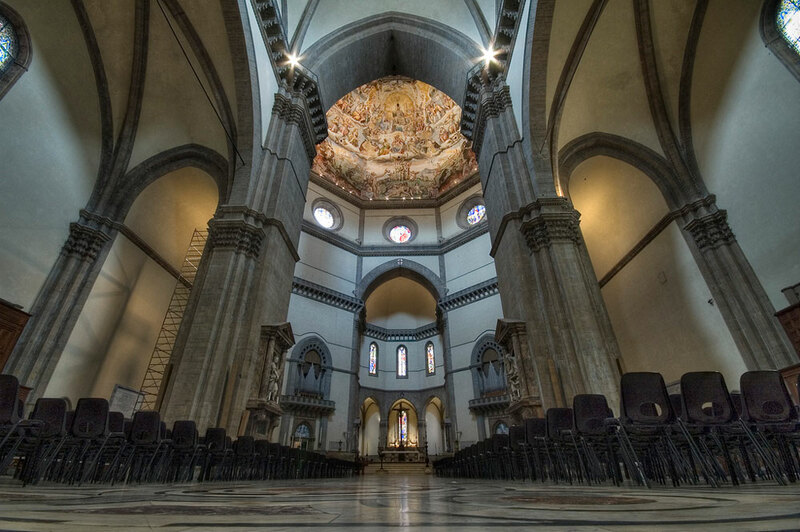 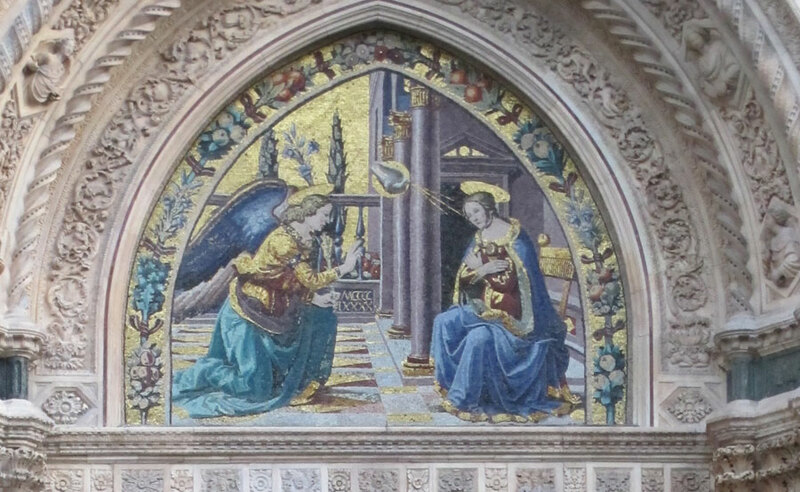 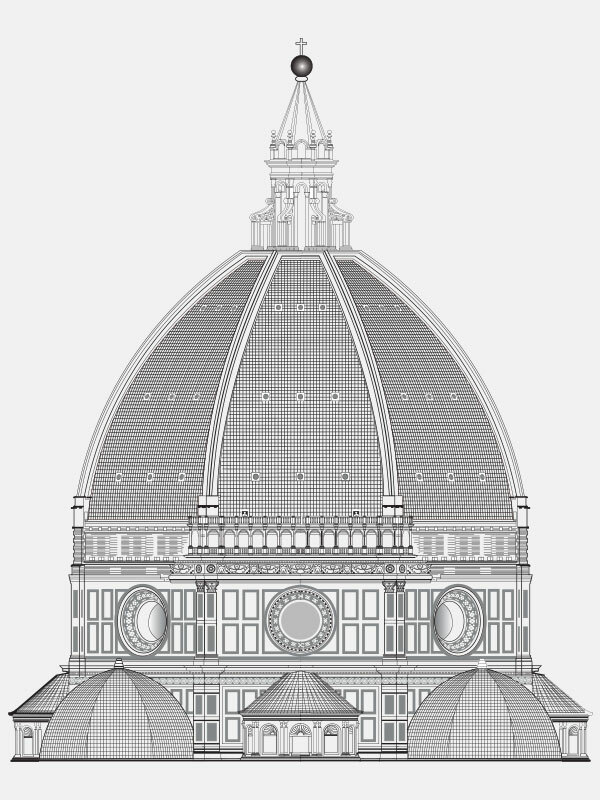 When Brunelleschi proposed to build the dome, people thought he was crazy and visionary. 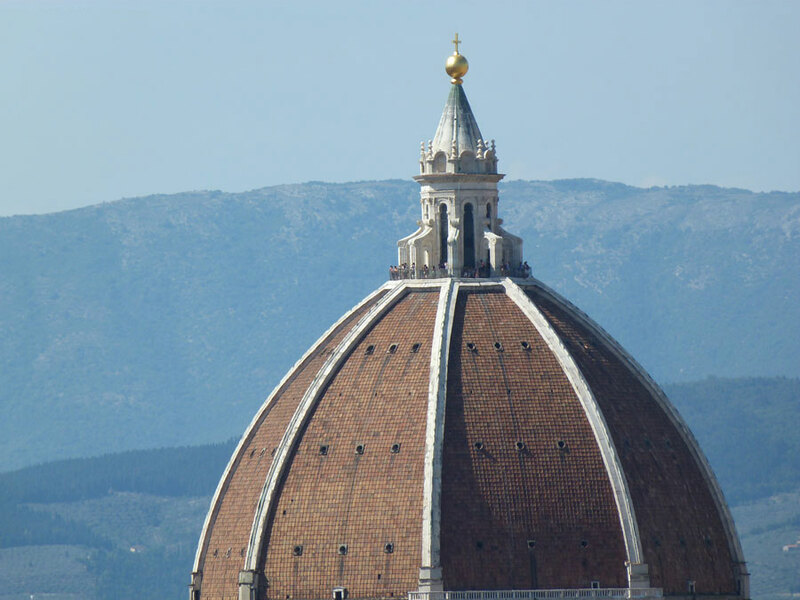 Nobody at that time (1436) thought it was possible that one could build such a large dome. 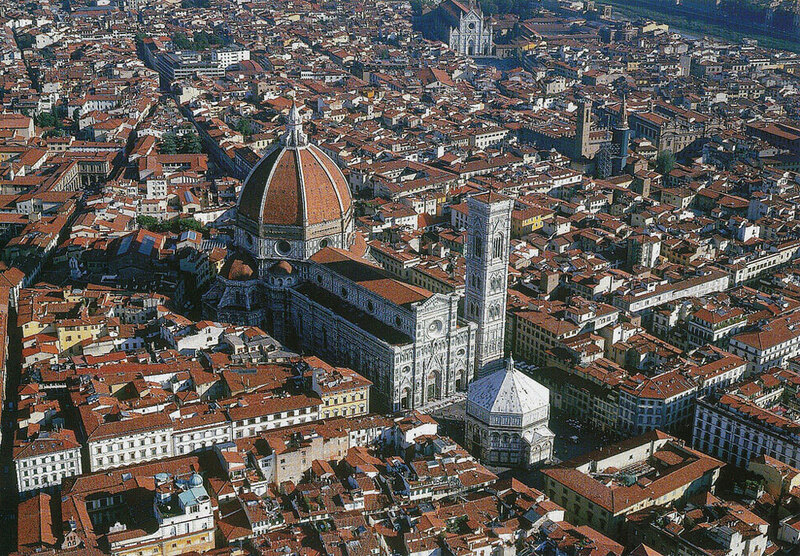 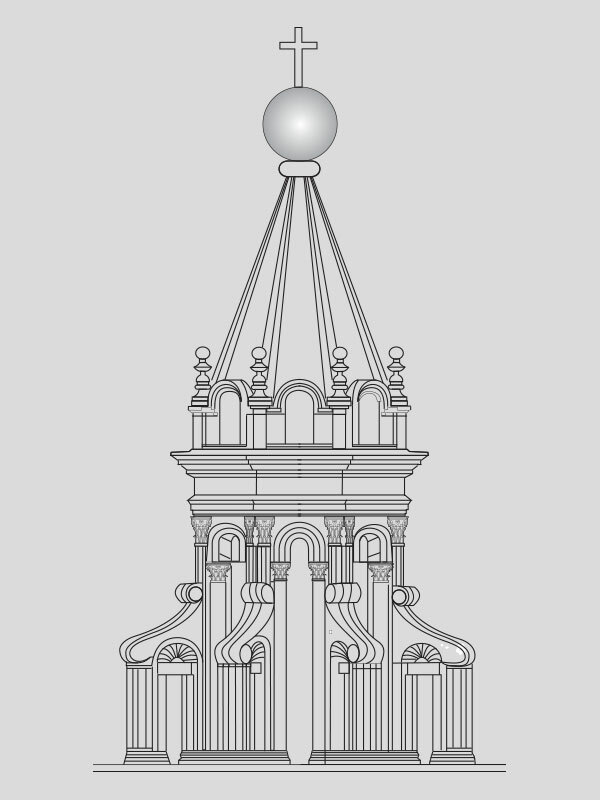 To convince the Florentines Brunelleschi designed a model on the piazza in the same scale of the later dome. 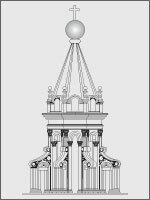 With this work, he became one of the greatest architects of all time.